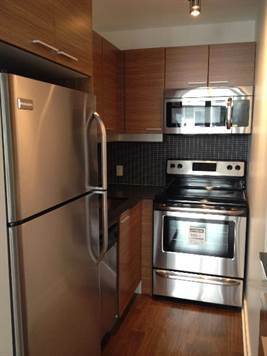 This one bedroom + den offers a sleek modern design for the discerning urban dweller. room, or add a futon/murphy bed for overnight guests. Rent includes heat & water. Tenant pays hydro/phone/cable. This unit does not come with parking but the building will have a Virtucar on site on a rental basis, or alternatively, a resident can get a City street parking permit, or lease an underground space from Vinci Parking. This building has a Silver Leeds designation for eco-friendly construction. Unit faces the inner courtyard away from the hustle/bustle of the street. Walk to the Glebe, restaurants, shops, etc.